The office of Solidarity Tracks has been one of the green spots of Lefkada since the launch of its sustainable development project. As a reward and, mainly, as the result of Andrea’s (our volunteer gardener chief) efforts spring came little earlier to the bureau than to the town. 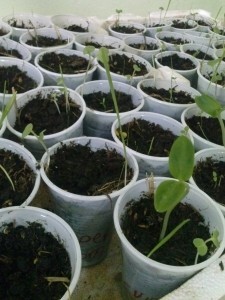 Roughly ten days ago the first baby plants started to discover the world from their small, carefully prepared cups. Thanks to our these tiny creatures have started their journey and now they are getting ready to move to their new home. The small vegetable embryos are the stars of the organization’s next workcamp within its eco garden initiative which aims the creation of an ecologic vegetable field in the village of Nidri. The kickoff will be on March 7th and, according to the plans, the newly prepared field is going to be inaugurated five days later,on March 12th. Welcome March! It is spring o’clock, so let’s garden! There is nothing too unusual about the establishment of a garden. Nevertheless, volunteers- both local and foreign- and the staff of Solidarity Tracks will strive during the next week to create a field that will go beyond the general aims of a regular vegetable garden. The land in Nidri shall be a place that can offer a place to practice and learn about vegetable growing, a meeting point for those who want to exchange relevant ideas or share their own experience. Furthermore, it should also serve as a spot for developing individually within and together as a community. The eco-garden aims to strengthen social bonds and promote mutual support and help giving. Therefore, the eco-field will function as a vegetable- and solidarity garden in the same time. Thus, the community of volunteers responsible for the maintenance of the eco-garden, should set an example and through their own efforts they can show how beneficial, healthy and enjoyable is to grow what you eat if you do it the right way and as part of a high spirited crowd. The initiative itself is part of a larger national project. Within its framework Solidarity Tracks volunteers and guest participants have already built an eco-home in Nidri and worked on the creation of a biogas system last year. 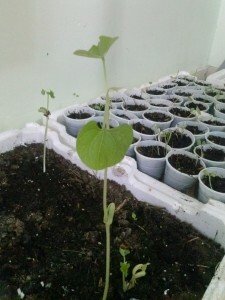 The eco-garden is the 3rd, and last, initiative of the activity series. Nonetheless, the establishment of the eco-garden should not be perceived as an endpoint but rather as the start of a lasting and living sphere for the community of volunteers, Lefkadian youth and the island as a whole. However, there is much to do until we will be able to see how the idea is put in practice within a larger community. What we can do now is to focus on the first and most important step: to lay foundation for the garden. And so we do, minds are set on the workcamp. As a consequence, there is always somebody who feels the need to secretly check the weather forecast hoping for a sunny next week. Also, presentations are getting ready for the discussion evenings which will take place after the morning field-activities. But, above all, everybody is dreaming about the taste of the first dinner cooked with the “solidarity veggies” and this gives a serious extra motivation to clean the wellington boots for a more efficient soil work. Volunteers are definitely getting ready to arrange the eco-garden, be together and, hopefully, give an inspirational place to Lefkada. The drafting of the article happened on a extremely sunny day when all doubted that rain clouds will occupy the sky of Lefkada. Today, when we publish it, we all stay with fingers crossed that the storm will actually go away. 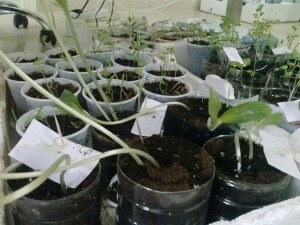 This entry was posted in Local and tagged community, eco-garden, environment, Lefkada, nature, Nidri, plants. Bookmark the permalink. ← Protect our seeds for a better future!